While Black Lives Matter is a movement around which emotions churn, it is in my view a wake up call to every American who has even the smallest inkling of concern about the future of American society. It is impossible for me to un-see the countless videos of police brutality broadcast in the media in the last few years. It’s too much. And while Black Lives Matter is a movement around which emotions churn, it is in my view a wake up call to every American who has even the smallest inkling of concern about the future of American society. America has simply not lived up to it’s promises in regards to the rights of black and brown people. Dr Martin Luther King Jr reminded us of that fact in 1963 and here we are 54 years later struggling with the same issues of race, class, education, health care and war. Gary at home on the Westside near downtown Santa Cruz with his partner Stephanie and their son Akoa. Why does America go to war so easily? And at what cost? At 12 years of age I experienced a significant lesson in American politics. I effectively lost an uncle to the unjust war in Vietnam. (The sitting U.S. president dodged the draft in 1968.) In 1970 my uncle, Private Frederick Dockery, came home standing on two feet, however his mind remained missing in action on the battlefields of Vietnam. I don’t think they called it PTSD back then. He had it bad anyway. To what end was his noble sacrifice? I remember being relieved in 1973 at the age of 15 when the selective service (draft) ended. I had narrowly escaped the potential terror of war and have lived a life of relative comfort and stability here in Santa Cruz ever since. Heaps of surfing lead to a 30-year career as a First Responder-Ocean Lifeguard and Firefighter. 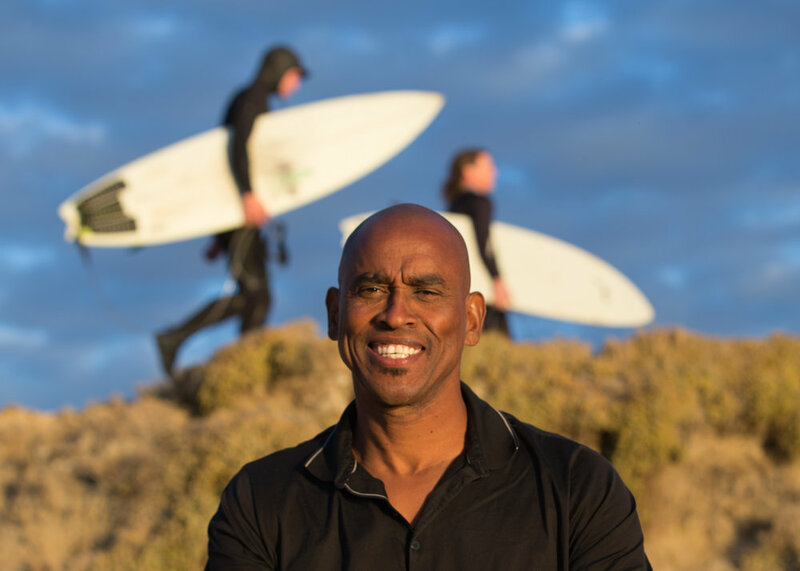 Growing up in Watsonville, Gary started surfing at the age of 14 out at Sunset and Manresa beaches. He's surfed all over the world, including Africa,Hawaii, Mexico and Central America. But what of America’s next war of convenience? How many Black bodies will the next one consume? How will I protect my young, caramel complected son from suffering the same, sad fate experienced by my uncle Fred? After recently retiring from a long career as a Firefighter, Gary has more time to spend in his board shaping studio.